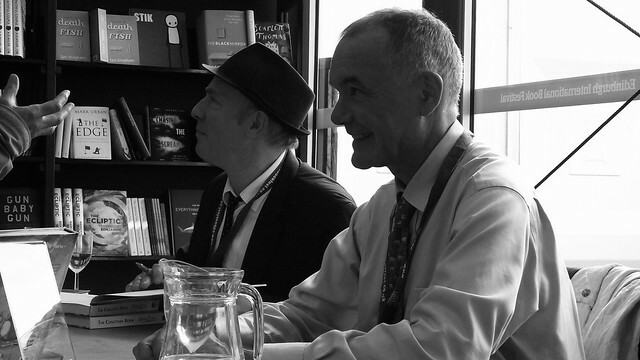 I have been waiting for this third volume in the Best of Enemies series for a while – back in the summer of 2015 author Jean-Pierre Filiu (a former French diplomat and now history lecturer) was at the Edinburgh International Book Festival, on a double bill with Martin Rowson and chaired by Teddy Jamieson. At that point the second volume had only just come out, and the audience were treated to a fascinating discussion by an author who didn’t just have deep academic, historical and cultural knowledge of the issues, but a lot of first hand experience from his years working in an NGO and as a diplomat. 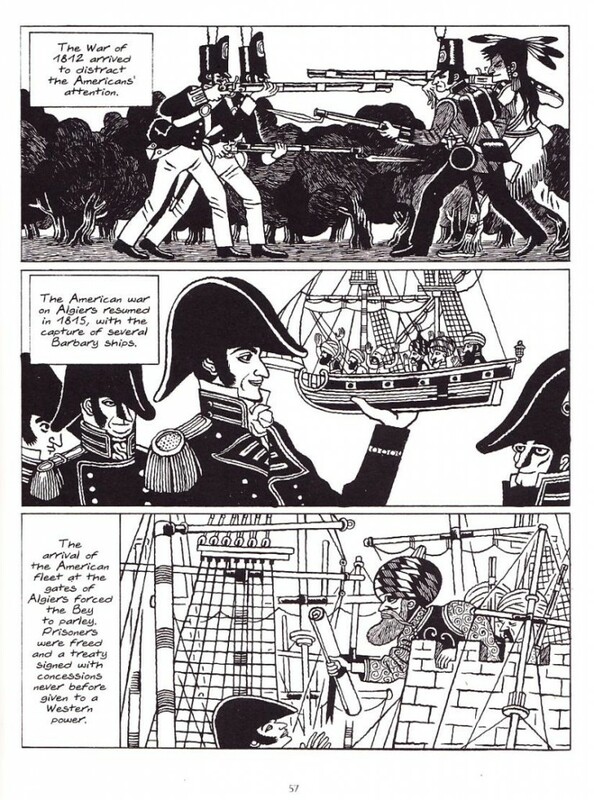 Ally this with some quite remarkable cartooning art by the great David B and you had two totally fascinating volumes of recent and modern history that has shaped – and continues to shape – our planet’s geo-politics. 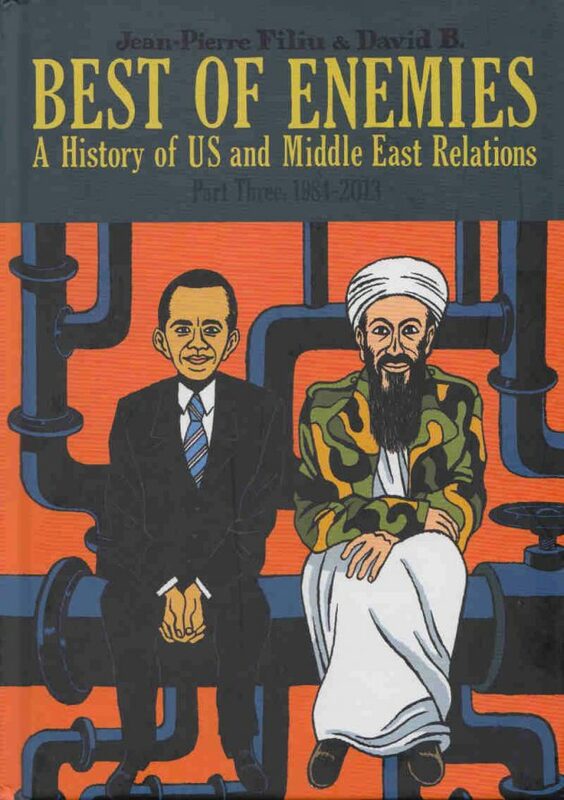 Jean-Pierre explained that the amount of work involved in researching and then illustrating the books had taken quiet a toll on David B, hence a bit of a gap between those two and this third volume, which covers US and Middle Eastern relations from 1984 -2013. And that right away makes an already absorbing read even more compelling, because we’re moving from history, both older (18th century and the earliest foreign policies of a young USA) and recent (mid twentieth century) to events most of those reading will have lived through, have watched on the news, often with varying degrees of anger and despair. And this third volume also takes a quality all of the best histories have, the ability to show that history in today: why our world is now as it is, because history is never just the past, dates, facts, events, it’s a rich tapestry, perhaps the most elaborate tapestry humans have created, so many inter-connecting threads all forming the today. The previous two volumes had this too, but with volume three covering such recent periods it really, really brings that aspect of history home to you, and that’s a damned good thing. In fact that’s one of the reasons many of us like to read history – we know the here and now is an expression of so many elements and events that preceded it, and we cannot hope to have any understanding of the now without that grasp of the earlier woven segments of that vast and never-ending tapestry. And even though the book comes to an end at 2013, it leaves things open, because that history is still rolling on, as we know all too well just from our news bulletins – this volume takes in events we’re still reeling from in horror right now, such as the vile slaughter in Syria. It is all but heartbreaking as Filiu and David B show how policies and events from decades before in different capital cities created the scenario whereby Syria could fall into the seemingly endless civil war that has horrified us all and which the world seems powerless to stop. We see American and European activities with Israel, Iran and Iraq and how they pulled in Egypt and Syria, adding dominoes to the line that would later fall with such horrendous consequences. We see Reagan, Bush (Snr) and Gorbachev, the USA and USSR both involved in talks in the Middle East, only for fledgling peace processes to falter and stall. We see that USSR collapse a little after those attempts to broker talks, then some years later the revived Russia under Putin intervening forcefully in those same regions. Of the globalisation of the “war on terror”, going from a supposedly noble aim (if you believe the propaganda about who we were supposed to blame, sometimes, but not always clear or true) to an easy excuse for any power to use for overt, powerful, often illegal actions. Extra-judicial killings and torture? This justifies it. Breaking the terms of a peace process? We have to, because we are fighting the same terrorists as you, so you have to support us. As Israeli PM Sharon says by way of an excuse “Everyone has his own Bin Laden”, to justify breaking the terms of peace talks and use of military force. Putin uses similar excuses in Chechnya, leaders even in supposedly democratic countries use it to justify civilian deaths in military adventures, torture and the erosion of civil rights. Yes, this will leave you not just upset, but angry, bloody angry, and you should be. Of course we have the benefit of hindsight here, always useful, those who made the decisions that started these various dominoes did not, but they also failed to make much of an attempt to look forward at the potential repercussions of their actions and policies, sacrificing the tomorrows to the expediencies of today, as politicians all too often do. 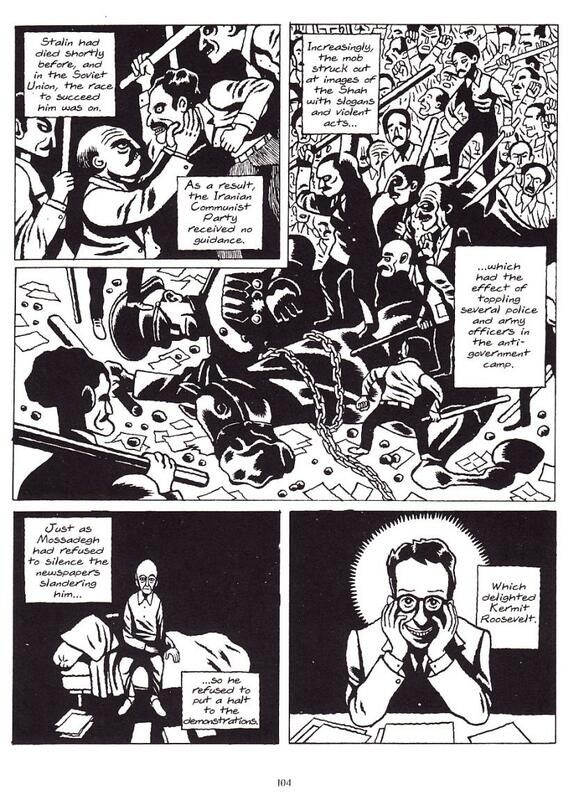 David B’s artwork is, once more, absolutely superb – this is the work of a comics master at the height of his powers. 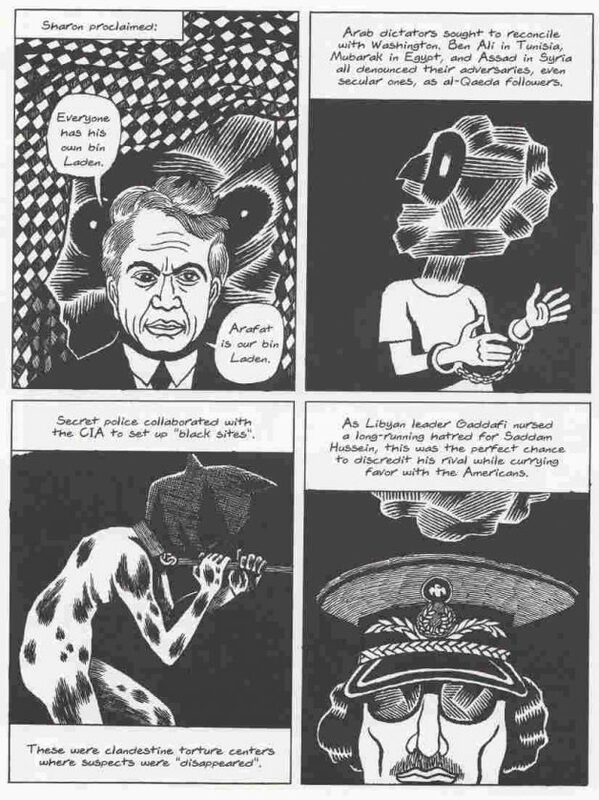 He summons both humour and horror, satire and sorrow – invading armies during the Gulf Wars are shown as giant soldier’s helmets on legs with giant cannon barrels projecting from them, he again uses differing sizes to denote the relative power of different players (so the US presidents and generals are shown as huge frequently compared to other leaders, despots like Saddam are small compared to US presidents in the art but huge compared to some of his own enemies like the Kurds). 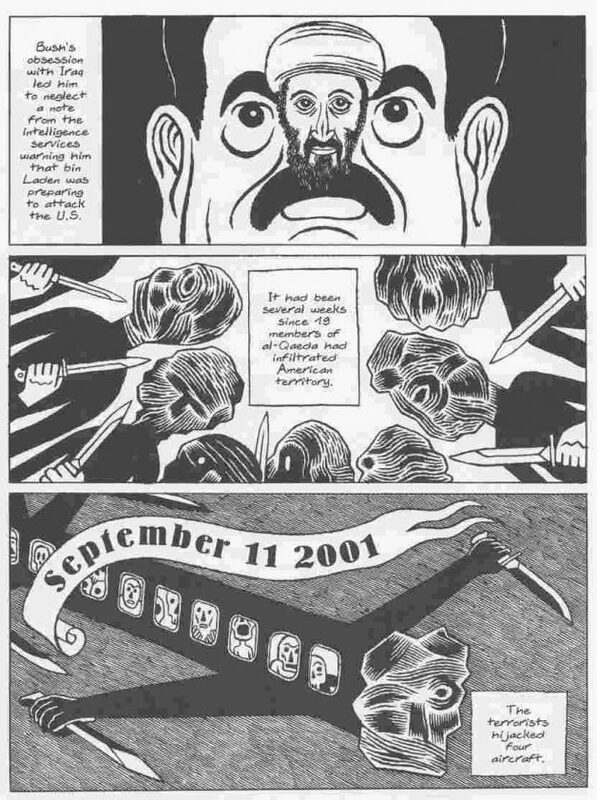 There’s humour to be had – a bellicose Saddam Hussein yelling threats takes the form of a giant thunderstorm of a speech bubble, like an adult version of the “swearing” in an Asterix album, or Clinton depicted with Pinocchio nose a he lies about Monica Lewinsky, but distracts everyone with a missile strike against terrorists, only for one of the missiles raining down to turn out to be his Pinocchio liar’s nose. 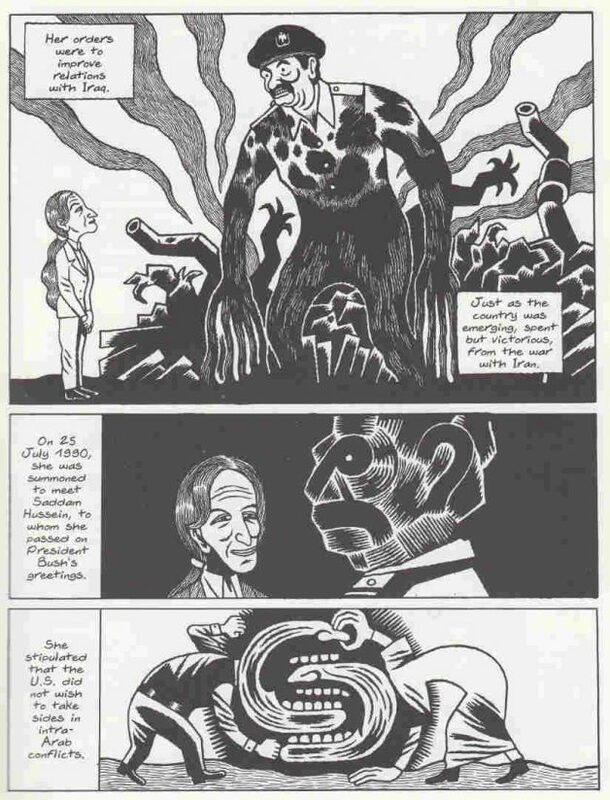 And of course the artwork conjures disturbing, even horrific imagery. 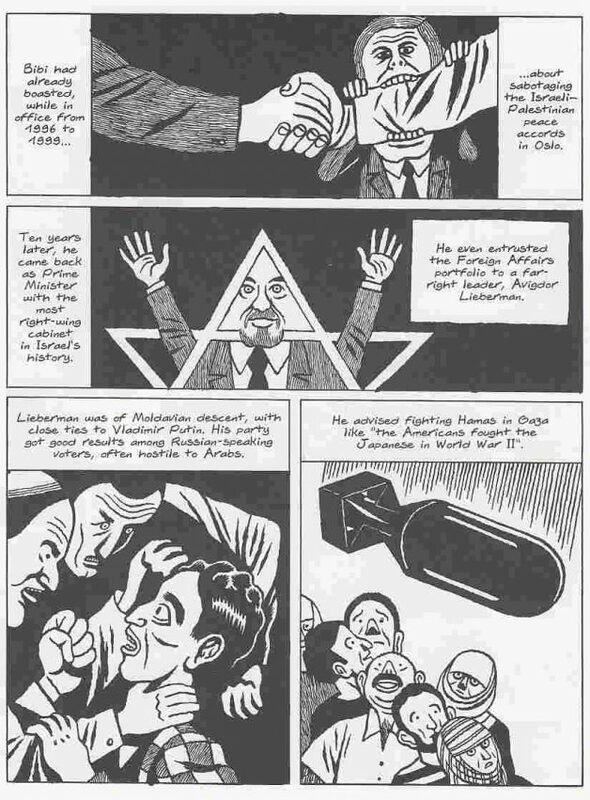 A panel depicting an Israeli-Hezbollah war in the Lebanon where, as usual, there were no clear winners but very clear losers – the civilian population (as in so many wars). The panel only shows a little, the bare feet sticking out from under the blankets covering the bodies, but it is more than enough, and it is echoed by later pages on the ongoing slaughter of civilians in Syria. 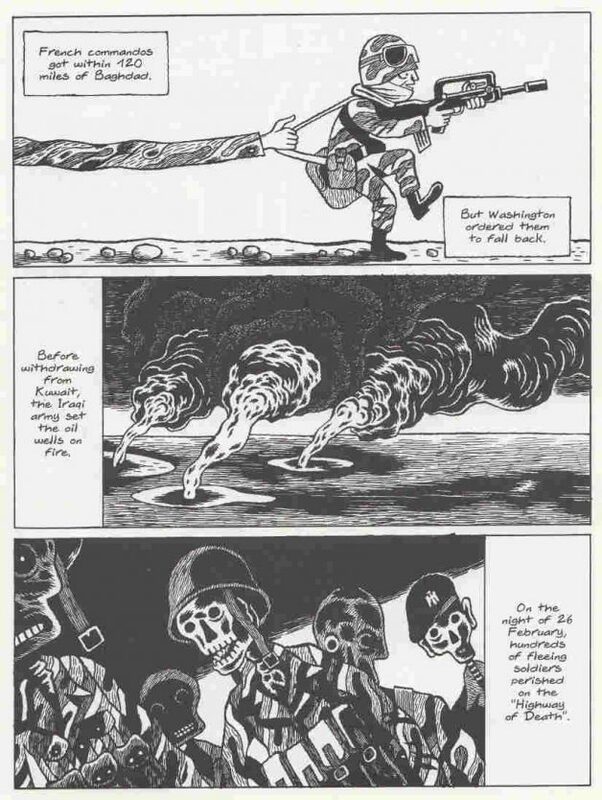 Another panel depicts uniformed skeletons, all that is left of large numbers of Iraqi soldiers after the mass bombing on the “highway of death”, or the gunning down of protesters and crushing of suddenly raised hopes during the Arab Spring, yet another a starving child in Syria, hungry mouth open but the only thing falling into it is barrel bombs, all depicted in clear, powerful black and white artwork. These histories take in cultural movements, political posturing, chicanery, greed, opportunism, nationalism, religious zealotry (Christian as well as Muslim), but also attempts at peace, noble aims of freedom and equality. In short these pages take in much of the worst and best of human nature, and they do so in a way that doesn’t point one accusing finger, for there is no one guilty party here. 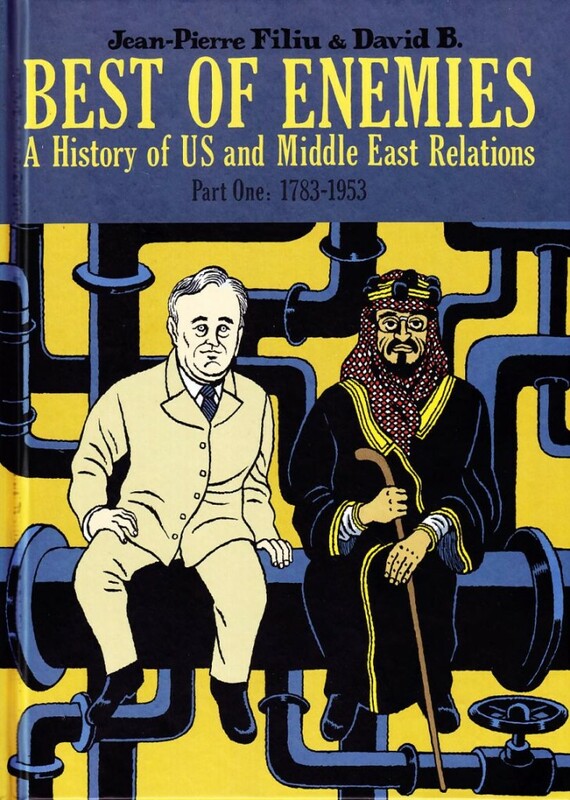 What this book and the preceding two volumes make eminently clear is how interconnected it all is, the actions and reactions and counter-actions from many different leaders in different years in different countries, all contributing to lead us to this point where we have madmen murdering innocents with airplanes into towers and others dropping bombs on civilians, and all of them in the name of some imagined higher purpose. 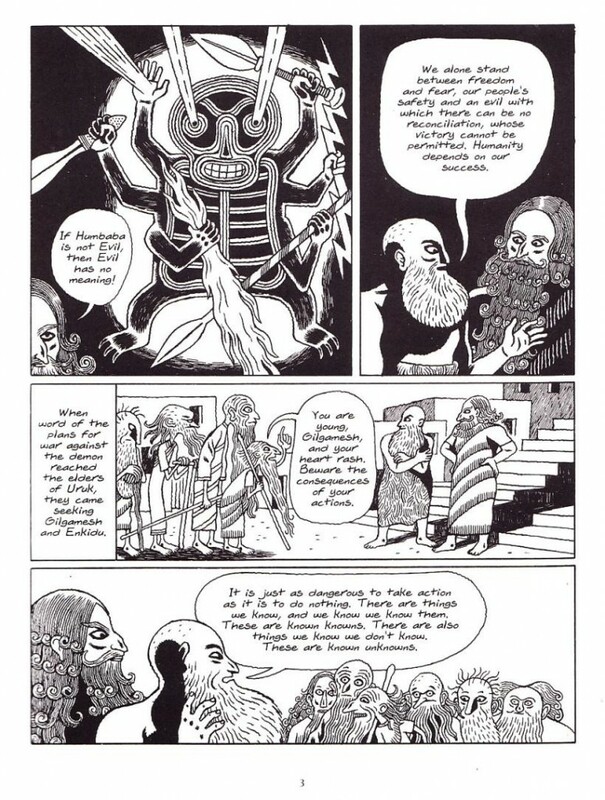 These are immensely complex woven threads in the grand tapestry of history, but Filiu’s expertise and deft analysis coupled with David B’s remarkable comics art makes it far more accessible and understandable than many prose works could. And we need to understand these things, we need to be aware of them to try and have some grasp of what is happening and why, and so what could be done to steer towards a more peaceful course eventually. 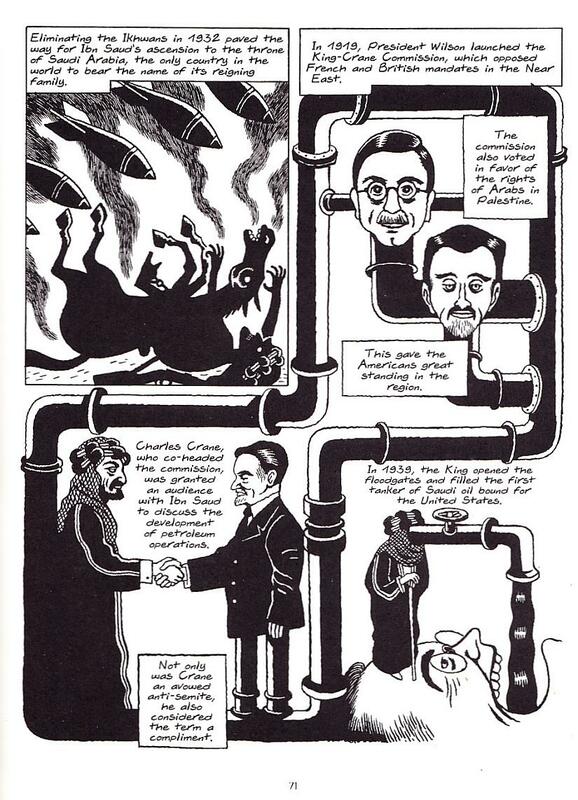 Sadly I doubt many of the world leaders who could really do with learning from these books will ever read them, but that should not stop us from doing so – this is essential reading, and a fine example of the power of the comics medium to make such a complex subject accessible and understandable to readers. I highly recommend this and the preceding volumes. 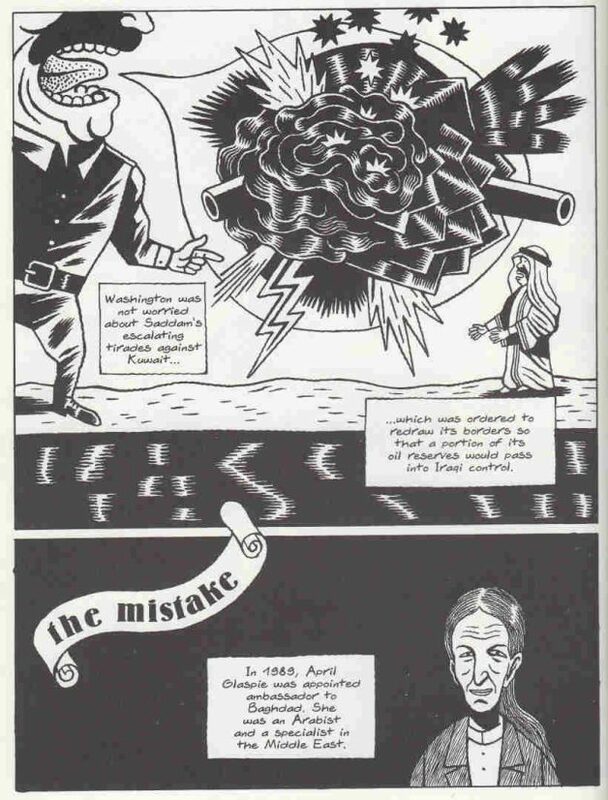 Our world, especially since the murderous events of 9-11, has been dominated by the relationship of the West to the “Middle East”, an often nebulous and catch-all terms applied to a wide geographical area and divergent peoples (although to be fair “the West” is a similarly catch-all term). And in particular modern international politics have been centred heavily on how the United States interacts with the Middle East, and the different ways the countries in that region interact with the US, some openly hostile, some allied (but always for a price of some sort), some can be a friend one day and a deadly enemy who must be fought to the death the next, as changes in administrations, ideologies and military and economic power (the two are often synonymous) dictate new policies and directions, decisions made in seats of government that will have huge ramifications for millions who really had little say in matters. Sometimes it’s a new oil refinery or rights to a naval base, sometimes it leads to all out war, and afterwards the shattered, pained aftermath of civil strife, more civilian deaths and desperate refugees trying to flee events they had no hand in, while in the West innocents are threatened by terrorism and fellow citizens become suspect simply because of their religion. It feels like a very modern problem, this “clash of civilisations” as it has been called, or also “the clash of ignorance” as the great Edward Said noted. Of course it is not and those who read history will doubtless already be aware that there is a long and quite utterly sordid and immoral history lying behind those current events and situations. In fact there is much, much more than most of us probably know. I’ve read a lot of history over the years, and while there were elements in here that I had some familiarity with – going right back to WWI and Lawrence of Arabia, and British, French, Russian and Turk machinations over the region for strategic and resource control – Jean-Pierre Filiu (former French diplomat, historian and academic) and the award-winning David B’s collaboration here exposes so much history, from the European-facing shores of North Africa (now staging post for waves of desperate refugees and god knows how many drowned on the way, these lands have always been a focal point for events) to the Persian Gulf to Israel and Lebanon. It’s a hugely complex jigsaw over overlapping interests from various powers, from religious fundamentalist leader to greedy corporations with the ears of their governments and competing military and economic interests. But it’s a complex subject which Filiu and David B make far, far for accessible using the comics medium (at a recent talk at the Edinburgh Book Fest Filiu mentioned in some of his university classes he also uses comics, such as Sacco’s Footnotes in Palestine, to teach his students about the history of the region). Filiu is a very thoughtful man with vast first-hand experience as well as academic learning on this subject, while it will surprise no-one who knows of David B’s work to learn that he creates some remarkably powerful and efficient imagery to communicate this subject which sprawls across decades and nations – from the devilish grin on the incredibly disturbing-looking US spook-master Kermit Roosevelt (cousin of the famous wartime president) gleefully working in shadows to change regimes (his techniques would later be applied by the US to regimes they disliked in South America too), to stylised images of cannons with legs to denote military force (or cannon with hands coming out holding money bags or diplomatic scrolls to denote negotiation), while leaders, Arabic and Western, sprout oil pipes for arms or Islamist terrorist and US soldiers alike are shown as human bodies clutching guns, but their faces are just huge, projecting cannon barrels. David B’s imagery is quite astonishing here, sometimes referencing older, period art styles (a few panels almost like woodcuts) and varies from realistic to surrealist images, and he plays often with perspective and sizes, powerful figures, be it a Western Admiral or an Eastern Pasha, shown as huge compared to the figures of those he is dealing with, or the giant turbans of 17th and 18th century pashas morphing to become a globe around which all the various parties orbit, or an image of the Grand Turk, his curling moustaches now curving blades of Turkish scimitars, diplomats are shown literally bending so far over to meet their aims that they are facing backwards, while others lie with mouths agape as a warren of oil pipes criss-cross the page, terminating above their open mouths which suckle greedily and insatiably on the oil. The imagery is quite magnificent, this is no simple depiction of events, this is the artist doing what a truly great comics artist does best, working with the author’s words but in a way which doesn’t merely illustrate or compliment, it enhances, tells a whole other aspect of the tale in its own right, making both words and pictures far more together than the sum of their parts. This is the work of a master, and I can see why Filiu mentioned that there will be a gap between the second book and the third, as the process is so exhausting to the artist. Space here does not allow for me to go heavily into the details of a century and a half or so of US interactions with the region (in which they actually coin the term “Middle East”) and besides, as I’ve already inferred, it’s far too complex to sum up in a review. Suffice to say it is a fascinating, compelling slice of history, laid out in an accessible, highly intelligent manner (and still retaining at certain points a playful sense of humour here and there to leaven the weight of other events), going right back to the newly independent US in the late 1700s encountering the infamous “Barbary” pirates that the European navies had long been battling (indeed the great Cervantes, author of Don Quixote, was once captured and forced to be a galley slave for these pirates who used the mask of religious jihadism to cover acts which were more for their own material gain than any true religious observance – not unlike many today misusing religions as supposed justification for attacking one group or another). And the opening prologue is a wonderfully cheeky delight, taking the oldest written story we humans have, the great Epic of Gilgamesh, born out of those same lands we’ve so recently bombed to dust (the cradles of human civilisation, no less), but reworks that great tale that has been retold for four thousand years around the world, inserting actual speeches by George W Bush and Rumsfeld into the mouths of Gilgamesh and Enkidu to justify their warlike raids on neighbouring, resource-rich lands. This isn’t just history repeating itself (and repeating and repeating…), it’s myth and folklore and culture and history and the same mistakes over four millennia, and we still don’t seem to be learning. An image of an ancient Sumerian stele unearthed in Iraq (now in the Louvre) depicts a pyramid made of the bodies of enemies, piled atop each other, then cuts to the infamous human pyramid of masked prisoners US soldiers arranged in Abu Ghraib for their own amusement. The ancient stele is called “the stele of the vultures”, the modern image from Abu Ghrain “a stele of the vultures for our century”. For anyone who admires the way in which comics can open up such complex subjects, and who admire world-class comics art, this is a must read. And for the simple fact it puts in context so much of what has shaped our troubled, modern world, it is also a book everyone should read and then sit back and consider. A modern classic. A number of people, watching ‘outraged’ Muslims burning Danish flags this last week (I use outraged advisedly since they were so outraged by Denmark they attacked EU buildings and American airbases, so a cynical person may think they just felt like having a good old riot about anything that came along) have asked the obvious question of where the hell did all these Danish flags appear from in Beirut, Tehran, Damascus and the fine desert oasis of Camelcrack? The intrepid Woolamaloo team have been investigating and unearthed some startling conclusions. We think it is a conspiracy by the shadowy conglomerates behind the international flag industry. It runs from the local scale, such as the Beirut Flag, Petroluem and Matches wholesale company to the huge corporations who manufacture the world’s flags. Demand in the Middle East for the Stars and Stripes has exceeded all possible supplies since George W Bush’s re-election. However, the secretive international flag merchants have warehouses full of the national flags of many nations who have rarely, if ever, offended a Muslim (admittedly a list which is getting smaller every day almost, since it now looks almost as if talking about Islam being offended about something is actually offensive too…). The flag conglomerates, working though political lobbyists, PR agents and media connections, in conjunction with their local Middle Eastern wholesalers, analyse their unsold flag reserve stock and compare it against countries unpopular in Muslim regions, before using their contacts to create a scenario which will soon embroil the country with the largest number of unsold flags to become the new target for the latest two minue hate. Sales of US and British flags have reached saturation point, plus they can’t keep up with demand, so now they can offload vast amounts of unsold Danish flags and grow new markets at the same time. Some major reference publishers and globe-makers who are controlled by the international flag conglomerate are also in on this, as fundamentalists worldwide require access to information on the flags of the world so they can order the correct flag to go with their matches and petrol. Like all large conspiracies this may seem fantastical at first, but considering the world is in a ferment over a cartoon and George Bush suddenly can reveal about a dangerous terrorist attack thwarted by intelligence several years ago magically a couple of days after he came under attack for the illegal wiretaps on American citizens (which he totally denied previously, stating such taps could only happen with judicial oversight) and suddenly it becomes easier to believe. Meantime it is a shame that Muslims are boycotting Danish goods and also forbidden from eating pork, as otherwise they could cook some great bacon sarnies over the burning flags and wash it down with some cool, refreshing Danish lager, make it a proper barbie, perhaps relax them a little. How few of these poor fundamentalists know that they are not being manipulated by angry Imans, Bin Liner, Areshole Hamza or the scripture of the Koran but by the secret cabal of international flag manufacturers?